used commercially for hatching chicks. Agricultural Research Service scientists have found a way to reduce Salmonella and dust in poultry areas. The technology may sound commonplace, but for many in the poultry industry it's exciting news. The technology uses a negative electrostatic charge to remove dust from the air. Unlike most air cleaners, this device does not require air to move through it for cleaning to occur. Reducing the dust is important, because these particles often give hitchhiking germs a free ride into chicks' lungs and feathers. Bailey W. Mitchell, an agricultural engineer, developed the ionizer system, in cooperation with veterinarian Henry D. Stone. Both researchers work at ARS' Southeast Poultry Research Laboratory in Athens, Georgia. ARS applied for a patent on the technology in July 1998. The first industry trials began in June of 1998, and a commercial product is now available. left sample is untreated; the right, treated. Early trials in 1994 suggested the process would reduce dust and had the potential to reduce airborne transmission of Newcastle disease virus and other disease organisms such as Salmonella. "When Bailey first started this work, we tested it in a small chick hatcher," says Stone. "He modified it many times. When I saw the consistent reduction in dust particles and bacteria during hatch, I knew it had potential." Mitchell says credit is also due to veterinary medical officer Daniel J. King, physiologist R. Jeff Buhr, and microbiologists Peter S. Holt, Richard K. Gast, K.H. Seo, Mark E. Berrang, S. Stan Bailey, and Nelson A. Cox for their collaboration with this research. Keeping hatching cabinets free of pathogens is especially important, because one infected hatching chick can very quickly spread disease organisms to an entire cabinet of 15,000 tiny birds. One reason: The strong air needed to move warmth throughout the cabinet also moves dust. Currently, chemical sprays are the only effective means of reducing airborne disease transmission in hatching cabinets, but they can be expensive and can damage hatching equipment. This electrostatic system would be safer for poultry and other livestock. It would also keep dust levels down better than existing methods and would continually clean the air of pathogens. The Simco Company of Hatfield, Pennsylvania, is one of the world's largest manufacturers of electrostatic equipment. Mitchell says the company provided electrostatic insights, equipment, and instrumentation under a federal-industry cooperative research and development agreement. "It makes sense that reducing the fluff in the hatching cabinet would reduce bacterial contamination at pipping," says Hank Engster, vice president of technical service for Purdue Farms of Salisbury, Maryland. Pipping is when the chick breaks through its shell during hatching. "We are pursuing a test of the technology at one of our complexes on the Delmarva Peninsula," says Engster. 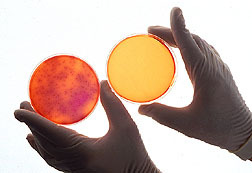 Experiments conducted in a small chamber with agar plates exposed to a continuous Salmonella aerosol showed that high levels of charge can, on average, reduce airborne Salmonella levels from over 1,000 per plate to near 0 in what appears to be an instantaneous sterilizing effect. The electrostatic technology consistently reduced Salmonella transmission between chicks by 98 percent and reduced Salmonella in air samples by 95 percent in a room with Salmonella-infected egg-laying hens. 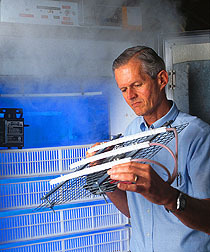 In other tests, Mitchell built up hatching cabinet dust levels to 40 times above normal. The device reduced airborne particles by 99 percent in 60 seconds. The system was tested on a hatching cabinet with a few infected fertile eggs interspersed among healthy ones. Salmonella counts in the guts of 7-day-old chicks in the cabinet with the device were reduced by a factor of 1,000- to 10,000-fold, when compared to counts in chicks in a hatching cabinet without the device. "We are mainly interested in the technology for food safety—but also for improved growth and productivity in our flocks," says Purdue's Engster. "We sent a group down to Athens, Georgia, to assess how well the technology would meet our needs. Bailey showed us a system installed at Seaboard Farms." Seaboard Farms in Athens supplies poultry for many fast-food companies. The company, with four hatcheries, produces over 5 million chicks a week. Installing the ARS ionizer costs about $2,500 per hatching cabinet. Seaboard Farms hopes to install it in all of the cabinets in one hatchery. "We tested the technology at our hatcheries," says Steve Bolden, vice president of live production at Seaboard Farms. "We found it reduced bacteria in three out of five tests and consistently kept dust levels down. We have negotiated with ARS to license the technology." In addition, hatchability—the percentage of eggs that produce live chicks—increased as much as 2.7 percent in tests of the system, thanks to reduced pathogens, Mitchell says. "Multiply this seemingly modest increase by the millions of hatching eggs farmers sell and you can see the potential." The technology has also interested turkey producers. Wampler Foods of Harrisonburg, Virginia, the seventh largest U.S. broiler chicken producer and third largest turkey producer, invited Mitchell to demonstrate the technology. Wampler is interested and would like to install units when commercially available, according to Tom Knapp, manager of Wampler's turkey breeding operations. He says the company is also planning on model modifications to better fit their hatching cabinets. "Initial tests in poultry production look promising in terms of improved vitality and health of flocks," says Knapp. "If we can verify reduced levels of bacteria, we think the technology would be a vital component to our overall live production health programs." According to Mitchell, numerous simple ionizer systems have been developed and marketed for air-cleaning applications with little or no research. Although many of these devices had potential in small spaces with light dust loads, they require air to pass through them and are not able to handle the larger space and higher dust levels of a typical hatching cabinet. The super-charged ionizer/dust collection system developed by ARS appears able to do the job. The process is likely to have applications outside agriculture, Mitchell says. In tests, the researcher removed smoke from a 3,300-cubic-foot room with 95-percent efficiency. Many other companies, he adds, are asking to review the technology for environmental and other air-cleaning applications.—By Jill Lee, formerly with ARS. This research is part of Animal Health, an ARS National Program (#103) described on the World Wide Web at http://www.nps.ars. usda.gov/programs/appvs.htm. Bailey W. Mitchell and Henry D. Stone are with the USDA-ARS Southeast Poultry Research Laboratory, 934 College Station Rd., Athens, GA 30605; phone (706) 546-3443 [Mitchell], (706) 546-3431 [Stone], fax (706) 546-3161. "Zapping Airborne Salmonella and Dust" was published in the March 2000 issue of Agricultural Research magazine.